RONCAGLIA is a small village just out of Pesaro along Italy’s Adriatic coast. The surrounding hills, bordering the San Bartolo Natural Park, have always been considered the most suitable for cultivation of Albanella, the local variety traditionally used for the white wine of the town. 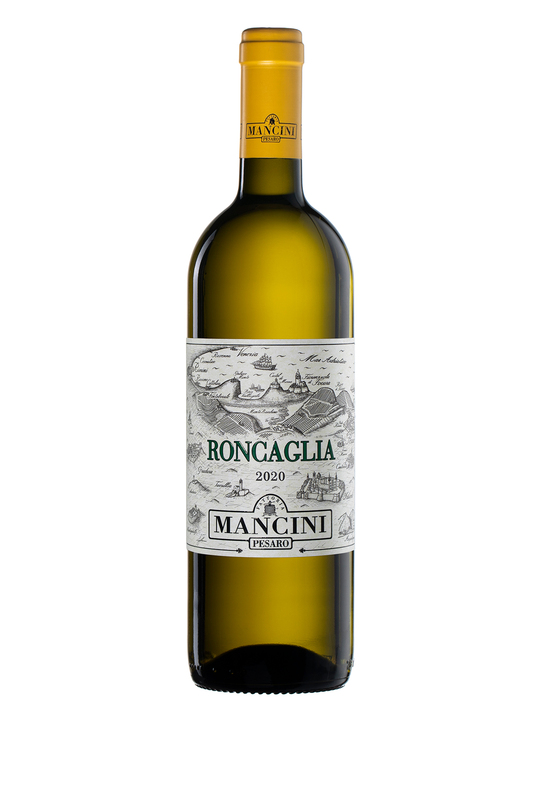 With Albanella grapes and a small addition of white vinification of Pinot Noir, Fattoria Mancini has produced a wine called Roncaglia from the early seventies. In 1994, after more than twenty years of production, this wine has been recognised as the D.O.C. Colli Pesaresi Roncaglia. To respect the distinctive characteristics of Albanella, Roncaglia is vinified in stainless steel. It is a wine of good structure and great longevity, with refreshing aromas and avour, appealing citrus notes and a typical minerality accentuated by the vineyards close proximity to the sea. Transportation: in baskets in a mobile cooling cellar equipped with an independent diesel motor. The cooling cellar is transported to the vineyard every morning, allowing the grapes to be cooled as soon as they are harvested. The cellar then returns to the winery in the evening to continue the cooling process during the night. The grapes are then pressed the next morning at a temperature of around 9°C. Vinification The grapes were whole bunch pressed at 9°C; must was extracted until 55% in weight of the grapes. The must was cold settled for 24 hours. Fermentation took place in temperature controlled tanks up to a maximum temperature of 18°C. Malolactic fermentation was not carried out.